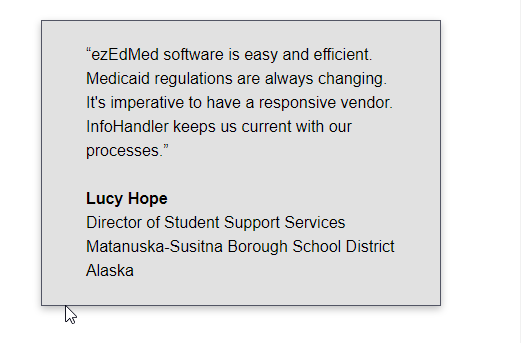 EZ Ed Med is a custom software that helps school districts to easily manage any special educational-related services. This software also ensures that school districts maintain IDEA (Individuals with Disabilities Education Act) compliance. Through the use of this software, school districts gain the ability to save their time. The tool is more than just a claim entry service. This is a tool whose major goal is to serve Kentucky school districts. EZ Ed Med was introduced by KSBA (Kentucky School Board Association) in order to help maximize the Medicaid reimbursements in the Kentucky school districts. The reimbursements in which EZ Ed Med helps in are largely for special education services. These include language and speech therapies, physical therapy, occupational therapy, audiology, nursing care, special transportation and the buying of technology devices to be used for assistive activities. Nowadays, EZ Ed Med is used by more than 3,000 teachers and therapists. These people use the software to monitor the progress and also document therapy for their students who have special needs. The Kentucky districts that utilize the EZ Ed Med software are usually divided into two groups. The first group contains districts A to J while the second group contains districts K to W. There are two different servers that serve each group of districts. The first server which is known as Ez Ed Med Ky 1 usually serves the first group, that is the group containing districts A to J. The second server which is known as Ez Ed Med Ky 2 serves the second group. In order to be able to use any one of these servers, the user has to have an assigned username and password. These are usually given by the Admin. 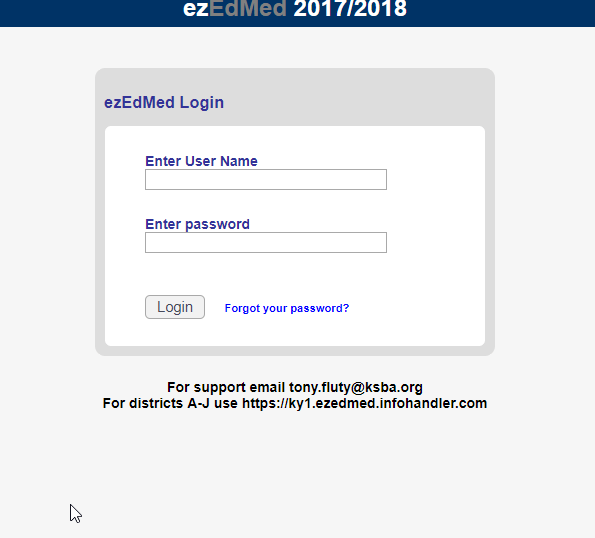 As it is clearly visible above, in order to be able to access the full features that Ez Ed Med has to offer, one must login first. In case the user forgets the password, he or she can easily recover his or her account quite by clicking on the forgot password link. For both Ez Ed Med Ky 1 and Ez Ed Med Ky 2, it is very easy to get access to support if any need arises. There are emails included below the login interface. To get access to the support, all that the user will need to do is to use that email to send his or her queries. The question that many people will ask themselves regarding Ez Ed Med is on how this software will help improve the Medicaid billing process and procedures. Let’s answer this question. The Ez Ed Med software is updated monthly and it is system verified. It helps reduce the amount of time that is utilized during the Medicaid billing process by eliminating the need to manually do certain tasks. For example, Ez Ed Med will automatically assign electronic signatures to therapy notes. This, in turn, will save valuable time for the teacher or the therapist. This ensures that the teachers and therapists shift from spending much of their time while doing their paperwork to working with their students. This they do while still generating the revenues that they need. The team behind Ez Ed Med is knowledgeable on matters pertaining to Medicaid fee-for-service billing. These professionals are willing to help any district in any phase while they are going through their billing process. Ez Ed Med software has the full support of InfoHandler team of technical experts. These technical experts can be contacted quite easily via mail or via their hotline which is toll-free. The above review is from Lucy Hope who has the position of Director of student support services in Matanuska-Susitna Borough school district which is in Alaska. She says that Ez Ed Med is a software that is very easy to use and also very efficient. She claims that Medicaid regulations are always changing. According to Lucy, it is good to have a vendor who is responsive. She says that InfoHandler keeps them current with all their processes. From the above review, it is clear that the users are enjoying the experience that they are getting from using Ez Ed Med software. However, another question that any potential Ez Ed Med user will ask themselves is which features he or she will find in Ez Ed Med. Enabling data tracking. Ez Ed Med also enables graphing of goals and objectives for IEP (Individualized Education Plan) students. Ez Ed Med will export PDF graphs and documents. This makes it easy for uploading to infinite campus. Ez Ed Med will interface with Kentucky Medicaid. This helps with the monthly capture of student data that is eligible. Ez Ed Med is a software that makes it easier for over 3000 teachers and therapists who are located in Kentucky to monitor progress and document therapy for students who have special needs. This software is divided into 2 servers. Each server serves a different group of districts. Through the use of this software, the teachers and therapists gain the ability to save their time and spend it more with their students instead of doing paperwork. From the review that we have looked at in this article, it appears that the people who are using Ez Ed Med are happy with what the software has to offer.